Lois Elizabeth Mitchell, 92, died on Friday, January 18, 2019 at St. Luke’s Hospice House in Kansas City, Missouri. She was born August 5, 1926 in Porter, Oklahoma, the daughter of William and Eliza (Hervey) Ryan. She was the 9th of 10 children. She was educated in Porter, Oklahoma and received her primary education there. She moved to Kansas City, Missouri where she was united in marriage to Charles Mitchell. 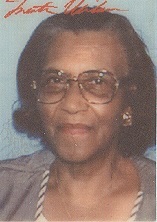 Lois accepted Christ at an early age and believed in Jesus Christ and was a member of St. Stephen Baptist Church. Lois is survived by her husband, Charles Mitchell, daughters Brenda J. Baker and Sandra E. Colbert, son Michael A. (Angie) Mitchell, grandchildren, great grandchildren, nieces, nephews and a host of relatives and friends. Visitation will be 9-10AM, with a service at 10AM, Friday, January 25, 2019 at Park Lawn Funeral Home, 8251 Hillcrest Rd. ; burial in Forest Hill Cemetery. Our thoughts and prayers are with you !! Hey family and friends. I'm praying for all of you in this time of morning. Aunt lois you will be missed but I know you are finally at piece. Say hello to my mom, Bookie, and Uncle Keith for me.